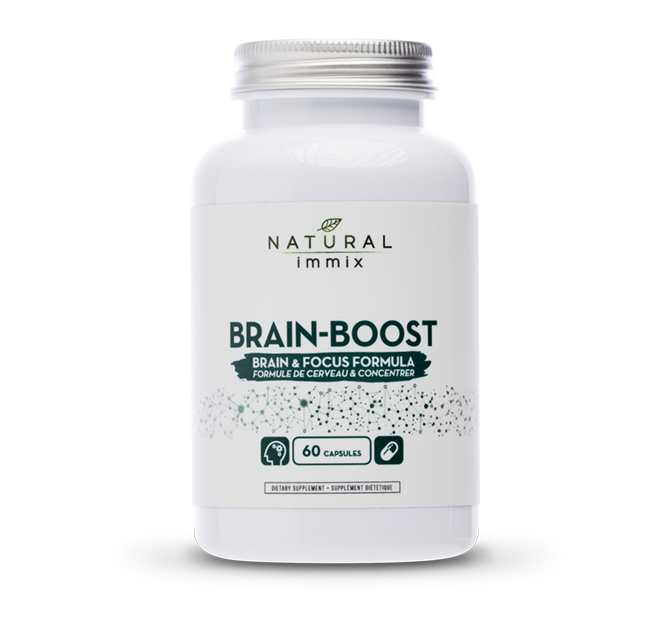 Brain-Boost is a dietary supplement that helps improve mental clarity and focus, boost memory function and increase levels of concentration and alertness. As an added bonus, Brain-Boost can provide an increased level of energy and improved mood. The proprietary ingredients in Brain- Boost, allow it to offer these benefits and more. By including a range of vitamins, including A, C, D, E and several important B vitamins, along with important nutrients such as calcium, potassium and choline, Brain-Boost is an all-in-one solution to improve memory, aid relaxation and maintain health. Vitamin & Mineral Blend: vitamins and minerals affect the brain by acting together to help manufacture the communication chemicals (neurotransmitters) of the nervous system, to help nerve-cell membranes send and receive neurotransmitters and to help convert food into Adenosine Triphosphate (ATP), which is the molecule that all cells use for energy, especially brain cells. DMAE Bitartrate: is responsible for improving mood, boosting memory function and increasing physical energy. L-Glutamine and Glutamic Acid: work together to improve mental focus and concentration. Green Tea Extract, Grape Seed Extract, Grape Fruit Extract & Cinnamon: are a source of antioxidants, polyphenols, catechins and proanthocyanidins for the maintenance, support and protection of brain health. Bacopa: commonly known as water hyssop, is an herb that has been used in traditional medicine for neurological rejuvenation, and has implications for memory enhancement and anxiety. Bacopa interacts with the dopamine and serotonergic systems, but its main mechanism concerns promoting neuron communication. It does this by enhancing the rate at which the nervous system can communicate by increasing the growth of nerve endings, also called dendrites. Supplementing Bacopa has been shown to improve cognition, by means of reducing anxiety. It is also reliable for improving memory formation. Though effects of this nature are usually studied in the elderly, Bacopa monnieri appears to affect young people as well, making it a useful Nootropic. Choline: is a macronutrient that's important for normal brain development and supporting energy levels. It works by stimulating production of the key neurotransmitter Acetylcholine, responsible for memory, mental clarity, and the healthy formation of synaptic connections between neurons. Inositol: is a nutrient that is a vital cofactor for the brain's major neurotransmitters. It is known to have a positive effect on depression, anxiety and memory especially when used in combination with Choline. Bilberry Extract: clinical research has demonstrated that berry fruits can prevent age-related neurodegenerative diseases and improve motor and cognitive functions. Its neuroprotective effects are related to phytochemicals such as anthocyanin, caffeic acid, catechin, quercetin, kaempferol and tannin. GABA: is a chemical messenger that is widely distributed in the brain. GABA's natural function is to reduce the activity of the neurons to which it binds. Some researchers believe that one of the purposes that GABA serves is to control the fear or anxiety that is experienced when neurons are overexcited. Olive Leaf: studies show that oleuropein, one of the main components in olive leaf, reduces the symptoms or occurrence of age-related disorders, such as dementia and Alzheimer's disease. Licorice Extract: may help slow the effects of aging on the brain and keep mental skills sharp. Carbenoxolone (CBX) is a glycyrrhetinic acid similar to substances found in the root of the licorice plant. Carbenoxolone appears to inhibit an enzyme in the brain that is involved in making stress-related hormones, which have been associated with age-related mental decline. DHA & Phosphatidylserine: are required for maintenance of normal brain function in adults and help to support neurons in the brain and to maintain memory function. Huperzine A: increases acetylcholine levels in the brain, which helps to increase information retention and memory formation, boost concentration, mental clarity and the ability to process or calculate data.